"Mister Rogers, and his earnest, tranquil demeanor, helped me through some difficult times in my childhood. His deep and simple credo helped to foster my creativity, strengthen my imagination, and bolster my sense of self-worth. Growing up, I was often snarkily asked how things were in my neighborhood. 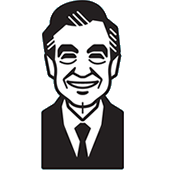 So be it if my last name conjures Fred Rogers' inimitable neighborly legacy. I am honored to share a name with the man. This is my tribute to him." A portion of the proceeds from the sale of this item were donated to the Fred Rogers Center.